Chemists can already identify molecules using their interactions with electromagnetic radiation. Working out what is happening inside the molecules in response to radiation is much trickier, however. 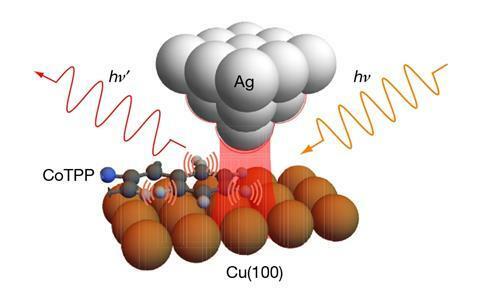 But now researchers in the US have used an atomic-scale metallic tip to focus light down to sub-atomic scales, and thereby to directly measure vibrations within single molecules. The research could potentially guide chemistry from catalyst design to superconductivity. Like musical instrument strings, molecules have ‘normal modes’ of vibration with characteristic resonant frequencies. Molecules absorb frequencies of radiation that excite these modes. The prominent absorption peaks in the infrared spectra of common molecules such as water and carbon dioxide are familiar to every student chemist. While measuring the absorption frequencies of a molecule is relatively trivial, assigning these to specific atomic motions is not. The problem is that, in traditional optics, two objects must be at least half a wavelength apart to be resolved. The infrared resonant frequencies of normal modes have wavelengths in micrometres, whereas atoms in molecules are only a few ångströms apart. Imaging individual molecules – let alone seeing inside them – is therefore impossible with traditional infrared or Raman spectroscopy. Chemists must therefore rely on theoretical analysis. ‘It’s a tremendous accomplishment of science that we can measure absorption frequencies of a molecule and then reconstruct its normal modes theoretically,’ explains chemical physicist Vartkess Apkarian at the University of California, Irvine. ‘That’s really non-trivial theory that has developed over the past hundred years.’ The theory works well for isolated molecules, but falls short when considering molecules in contact with surfaces, for instance. A potential solution lies in plasmonics. Plasmons are quantised oscillations of a metal’s free electron density. Despite having atomic dimensions, they can be excited by infrared light, allowing electromagnetic radiation to be squeezed down to the atomic scale. They have been used to hugely amplify weak Raman signals by placing the sample on a gold or silver substrate – a technique called surface enhanced Raman spectroscopy. ‘There are tens of thousands of papers published annually, but the details of the effect have never been really controlled or understood,’ says Apkarian. In the new research, Apkarian and colleagues immobilised individual molecules of cobalt(II)–tetraphenyl porphyrin under ultrahigh vacuum at cryogenic temperatures. They brought a silver scanning tunnelling microscope needle with just one atom at its tip within 2Å of the surface. As they scanned the tip repeatedly over a molecule, they used it to inject photons of various infrared frequencies into different parts. Photons of various frequencies scattered by the Raman effect were detected by the tip, allowing the researchers to measure the response of different parts of the molecule to different frequencies of light. ‘In the past year or so there have been quite a few theoretical papers suggesting it should be possible, but this is the first demonstration of, effectively, a microscope that reaches down into the atoms of a molecule,’ Apkarian says. ‘It’s a very nice paper,’ says nanoscientist Jeremy Baumberg at the University of Cambridge. ‘People, ourselves included, have shown that you should be able to get very high resolution spatial imaging using a tiny tip. Now this is not just looking at the atoms, but imaging the bonds directly through their vibrational information – and that’s then all of chemistry.’ He cautions, however, that the extreme conditions required mean that ‘how it’s going to help us move forward with, say, catalysis is pretty unclear’.